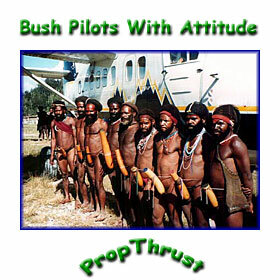 PropThrust is a pilot with an attitude. PropThrust is an old and bold pilot who tries for the most part to keep out of trouble but somehow just can't help expressing his opinions. PropThrust is a pilot suffering from too many bad weather days and too much time on his hands. Follow the links below for PropThrust Stories! Don't be afraid to write in with your own version of right from wrong and get published on eBushPilot. How to Talk Yourself into Landing Inside an Active Volcano. Here is an article that tests the limit to the "Challenge and Response" checklist that we all know and love. Would You Fly in a Single Engine Aircraft? Many large companies won't award contracts to single engine aircraft. Is there a reason or is their reasoning just a hang over from WW11? Don't Blame the Starving Masses, Blame the Oil Companies. The environmentalists say that the oil companies destroy the rainforest in their quest for black gold. That is not entirely true. Or at least that belief needs to be qualified. A Lesson in "Down but Not Out". Making a Connection. Trouble shooting by connecting the dots. The attitude indicator will guide you back to the Home Page. Last modified on Jan 02, 2013.